Finally! !Here we have the new album of EXXPLORER!! 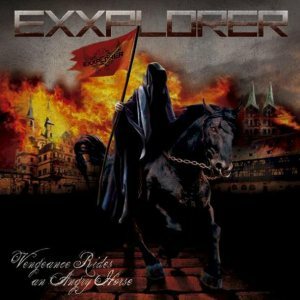 EXXPLORER is a U.S. metal band that released the legendary album “Symphonies of Steel” in 1984 by Black Dragon Records. “Symphonies of Steel” has been released all these years in many different versions!! Fifteen years after their undergound metal opus “Symhonies of Steel”, they come back and release their new album, “Vengeance Rides an Angry Horse”. From the original line-up that recorded that really great, legendary debut album two members have changed but the rest of the line up is still here. The new members of the line up are Fred Gorhau (guitarist) and Jay McCaffrey (bass). The music of the album is mid-tempo heavy metal, with a great guitar work that has been delivered by Kevin Keneddy. The voice of Lennie Rizzo isn’t so high pitched as it used to be, but this doesn’t mean he is a bad vocalist! He sings in a middle range and he manages to do it well. The album flows pleaseantly and this is one of biggest advantages of “Vengeance Rides an Angry Horse”. Maybe the best tracks of the album are “Gypsy”, which may be big but doesn’t tire the listener, “Glory Hunter” and “Valley of Doom”. In coclusion this is a good choice for all the classic metal fans! “Vengeance Rides an Angry Horse” is one of the top albums for 2011 in the traditional metal subgenre!! P.S. : The cover of “Vengeance Rides an Angry Horse” is really beautiful and the production of the album is really good!! Thanks so much for this great review, we really appreciate it, and we’re happy you like the new album. Just a quick correction. This is not the full original lineup. Lennie, Kevin and Mike are original from Symphonies of Steel. There are still 2 guitar players, Fred Gorhau and Kevin Kennedy, and the Bass Player is Jay McCaffrey. I wanted to write you a very small remark so as to say thanks again over the beautiful guidelines you have contributed on this site. This has been quite shockingly open-handed of you to deliver freely exactly what many of us would’ve sold as an e book to make some dough on their own, even more so considering the fact that you could possibly have tried it in case you desired. These concepts likewise acted like the great way to recognize that most people have the same dreams just like my personal own to know many more when it comes to this issue. I’m sure there are a lot more pleasant occasions up front for those who take a look at your blog.